A mere two hours away from Paris, Domaine du Grand Bois is situated in the heart of a beautiful 100-hectare woodland. Designed as a village, you can either explore the lush setting at your leisure, or take part in the many activities available. 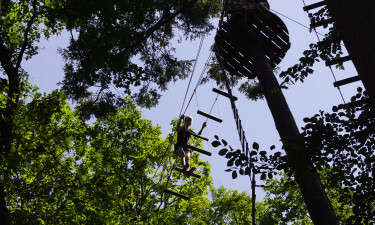 For the young or old, Domaine du Grand Bois is a fantastic LuxCamp location. Located in the middle of a calm forest, the surroundings are perfect for a relaxing luxury camping holiday. Mobile home users can enjoy perfectly equipped private cooking facilities, or breakfast in style from a choice of buffets. 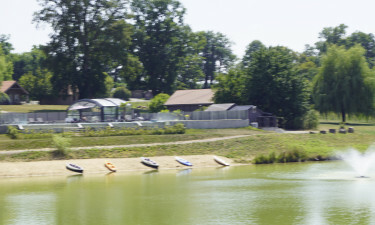 Why choose camping Domaine du Grand Bois? 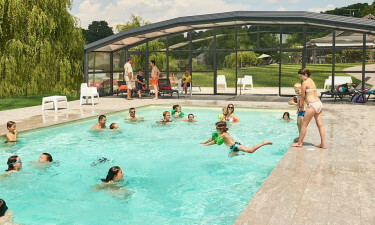 This luxury camping facility has an outdoor pool which includes a childrens' pool and lazy river, an indoor pool with a large, water-side terrace, and there is even a temperature-controlled, outdoor jacuzzi with massaging jets so you can relax in the water after a spell in the sauna. Cycling, canoeing, electric boats and quadribiking are great ways to get in touch with this enchanting forest and its lake waters. For those preferring indoor activities, billiards and board games are also available. If you get hungry, there is a snack bar and terrace open all year round, or a food truck for those visiting in high season or during French school holidays.